Tomorrow is November the 11th, Armistice Day, on which we remember the thousands of men and women, of Great Britain and the Empire, who lost their lives in the Great War. This evening I want to take the opportunity to remember also the much greater number who served and had the good fortune to come through and continue their lives after the end of the fighting. They shared the same risks and deprivations as those who were killed, but were more fortunate. Others saw the lives changed in many ways, as the war affected the whole population. The country had to continue to function, and there was the inevitable struggle to cover the gap in the work force created by the ever-increasing demands of the armed forces. A vast administrative and logistical structure that sprang into existence to keep the forces in the field, supplied, fed and given medical and spiritual support. In 1914, the population of the United Kingdom stood at 46 million, including 4.3 million in Ireland. By the end of the war over 5 million had joined up, including 2.5 million conscripts, almost 1 in 4 of the entire male population. The country suffered an estimated 744,000 combat deaths, about 18% of all the UK’s armed forces. The total increases to about 800,000, nearly 2% of the entire population if civilians are included, not to mention the 228,000 UK citizens who died in the flu pandemic of 1918-1919. In addition to investigating the stories of the men named on the War Memorials in Bottesford and Muston, members of the project have looked into all the local men who enlisted as volunteers and conscripts during the war. How many were they? Who were they? What happened to them? One of the outcomes of our project is the emergence of a new ‘roll call’. This is still very much work in progress. We have biographic information for more than half, but there is still some way to go. A major problem is the poor state of records. After the war, many were disposed of, others lost, and many more went up in smoke during the Blitz. However, making use of those that remain is made easier by the advent of the internet. Information is also found in official War Diaries, the Leicestershire Records Office and of course from personal family memories and records. 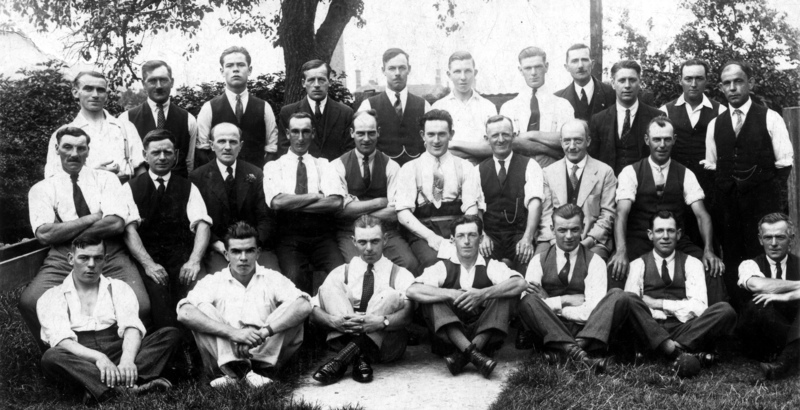 Who were the men who joined up in Bottesford? In the case of Bottesford we have, in addition to the War Memorial, the list of service men which Sue and David Middleton turned up at the Records Office at Wigston Magna (DE4867/1), at the foot of which are the words “This list was found behind the organ of St. Mary’s church, Bottesford, Leicestershire in 1995. It is a list of all those who served in H.M. Forces in the Great War, 1914-1918. Given to the Leics Record Office 1996 by the Reverend G. Spencer”. Frustratingly, there are, as David Middleton has pointed out, no indication who compiled the list or on what basis. Also, it has become clear that this list is not complete. The Chapel Roll of Honour includes four names not seen on the ‘church list’. The Absentee Voters list of 1918-19 includes another four names not on the church list. This was compiled in preparation for the General Election held soon after the Armistice, recognising the enormous number of servicemen eligible to vote but unable to do so without special arrangement. The Bottesford Electoral Register of 1919, which includes names labelled ‘NM’, meaning ‘Naval and Military’, has yielded another fifteen. Some other names have emerged from press articles mostly from the Grantham Journal. As a result, the Bottesford list now has 212 named servicemen. The 1911 census of Bottesford recorded a population of 1164, of whom 547 were males. How many would have been eligible to enlist? An eleven year old in 1911 would have been 18 in 1918; a 37 year old in 1911 would have been 40 in 1914. There were, in Bottesford in 1911, 214 males between 11 and 37, who would have been eligible on the basis of this age range. This figure is very close to the 212 who we know actually served. Admittedly, this is to some extent a coincidence. The actual list includes men not in the 1911 census, and there are census men not in the roll call perhaps because they had moved away. Even so, it suggests that effectively all those eligible to enlist actually did so, amounting to 38.8% of the men in the village, above the national average of 1 in 4. In addition, the ‘roll call’ of 212 includes the 30 who were killed, indicating that the rate of mortality among the Bottesford contingent was about 14%, close to the national average of about 18%. Who were the men who joined up in Muston? For Muston, there is no equivalent of the ‘church list’, which makes our task more difficult. We have gone back to the 1911 Census. Sue Middleton trawled through the census to identify men of suitable age to enlist, and from these a number of those who did so have been identified and investigated. Other names were added from the Absentee Voters list and other sources. Inevitably, the population in 1911 would not have been exactly the same as that in 1914. Also, when we do not find any military records it is hard to know if the individual genuinely did not join up or if his records have been lost: it is hard to prove a negative. And there are examples, at least three in Muston and one in Bottesford, in which one farmer’s son appears to have been exempted, though his brother joined up, presumably to manage the farms that were so vital. The ‘roll call’ for Muston currently contains 45 whose war service can be confirmed, including the 11 named on the War Memorial. The 1911 Census recorded a village population of 259, including 116 males. If 45 of these joined up, then the rate of enlistment would have been 38.8%, the same as at Bottesford (by coincidence) and again well above the national average. About a quarter of these lost their lives, another figure well above the national average (and greater than the proportion from Bottesford). Was this because the men from Muston were mostly manual workers (agricultural workers, quarrymen, railwaymen) who were placed in front line infantry regiments where the risk was greatest? Who were the youngest and oldest recruits? It appears that Bob Sutton was the youngest Bottesford army recruit, who at the age of 15 enlisted as a bugler in the Manchester Regiment and went on to fight in Mesopotamia. Bob was taken prisoner in 1920, while in the Army of Occupation, and not released until 1924. After that, he stayed closer to home and lived his full span. Interestingly, the youngest in the whole country was Sidney Lewis, who was just 12 when he joined the East Surreys, then fought in the Somme before being sent home, aged 14, when his mother demanded his return. He had been awarded the Victory and British War Medals, and re-enlisted in 1918. The oldest Bottesford and Muston recruit may have been Reginald Barke, a master tailor who joined the Labour Corps in 1917 aged 41. Reg first attested in 1915, but was not called up till 1917 when his service officially began. He joined the Labour Corps at Étaples. He died at Bottesford in 1943 aged 64. The recruits from Bottesford and Muston were posted to a wide range of army units, together with the navy and air force. Most joined the county infantry regiments, the backbone of the British army. The Leicestershire Regiment had the largest number, 25 at the last count, and there were smaller numbers in the Sherwood Foresters (9) and the Lincolnshires (6), and others spread through other regiments from the Kings Own Scottish Borderers to the Duke of Cornwall’s Light Infantry. There were at least five who had emigrated to Canada and joined the Canadian Expeditionary Force, four of whom were killed, and another emigré who joined the Australian Infantry, who was also killed. There were men in the Royal Artillery (10), the Royal Engineers (7), the Machine Gun Corps, the Tank Corps, the Army Service Corps, the Labour Corps, the Ordnance Corps, the Army Medical Corps, and the Army Veterinary Corps. There were men in the Royal Navy and the Royal Navy Volunteer Reserve, and also in the RFC/RAF. Most enlisted for the duration of the Great War, but there were professional soldiers who had fought in the Boer War, and others who stayed on and fought in the Second World War. There are many stories of servicemen suffering illness and disabilities that led to a premature death after they had been discharged from the forces. However, though this undoubtedly did affect men from Bottesford and Muston, the cases we know of are few in number. On the data we have at the moment, the great majority who returned lived to be over 60. Four reached their nineties, 19 their eighties, 30 died in their seventies and 15 in their sixties. In contrast, only 15 died before their fiftieth birthday, including three in their twenties. The youngest were two farmer’s sons, Isaac Bonshor and William Hedley Miller, both aged 21 when they died of influenza. Another sad example was Lionel King, grandson of a local Methodist preacher, who died in 1922, aged 24, after gaining his BA at Christ’s College, Oxford. However, it is important to remember that many, probably all of the survivors, carried with them the effects of their injuries and wartime experiences for the rest of their lives. Most preferred to forget as far as possible, and stories are legion of grand-dad who never talked about the war. Others, like Lieutenant Andrew Nugee, who wrote about his injuries and consequent blindness, help us realise what they went through, but for most others we can only guess. We are attempting to create brief biographical records of all the individual servicemen. For those who lost their lives and are commemorated on the village War Memorials, David Middleton has created the detailed and moving accounts published on this website and reproduced in the forthcoming book, Lest We Forget: Bottesford and Muston in the Great War, by David Middleton and Catherine Pugh. In addition to these are the biographical records for the servicemen who survived, which are being added to the website. They vary enormously in the amount of detail that we have unearthed. Many are brief, typically giving a census-based account of family background, brief military records, and something about their life after the end of the war. Others go into much more detail, where our investigations justify it. The stories that are emerging illustrate the range of experiences that the men had. That was a super talk that you gave on the 10th Neil. Many thanks to you and all your fellow contributors to the content, and thanks for posting these notes.